Online website optimization tools: explore and see your site like webengines. Count and display broken and internals links. Get Google pagerank for each file and generate a SiteMaps file in XML format. Keyword Crawler could also calculate word density in pages and display the metas and observes the directives of the robots. 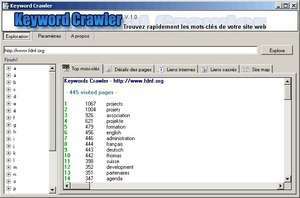 For security reasons, you should also check out the Keyword Crawler download at LO4D.com which includes virus and malware tests. Additional screenshots of this application download may be available, too.